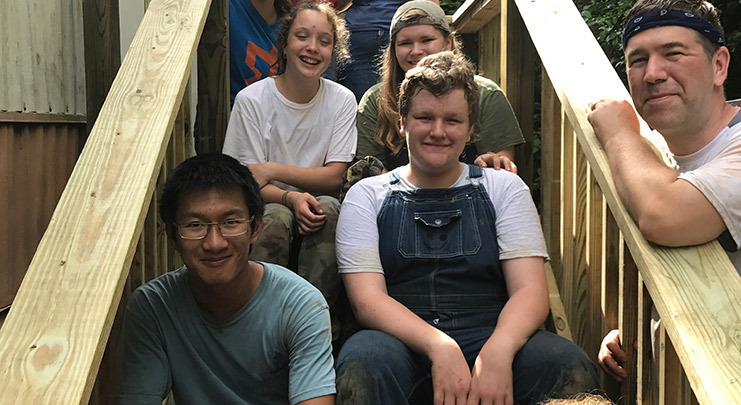 The members of Saint Mark provide support to the following local missions and agencies through gifts of time, talent and financial support: Interfaith Works, Action in Montgomery, Bethesda Cares, Family Services, Rebuilding Together Montgomery County, Habitat for Humanity and A Wider Circle. Financial support is also provided to: The ARC Montgomery County, Cornerstone Montgomery, Manna Food Center ands. Crossway Community. The Congregation's global reach includes groups working withing 6 specific areas: Disaster Relief, Saint Mark Member led projects with Global Reach, PCUSA Missionaries, Education – Scholarship, Materials, etc., Hunger advocacy, mission, etc., and Refugee resettlement. Projects supported include: New Story Leadership , Lithuania Christian College Scholarship , Sayariy Warmi Rise Up Women , EduCorps , Reve Kandale – Helping build schools and plant trees to bring hope to communities living in hard to reach places in rural DRC. The congregation has also helped build a well in Cameroon. Members have also assisted the Hawari family (Syrians) to resettle in Montgomery county, as well as donated to Presbyterian Disaster Assistance and Mission co-workers in Lithuania through Presbyterian Mission Agency. One of the areas of global mission focus for Saint Mark is Haiti where they have formed a strong partnership and friendship with an organization called Hearts with Haiti, the umbrella organization for the St. Joseph’s Home for Boys, Wings of Hope, and the Trinity House.